WASHINGTON, Sept. 13, 2018 — More than 7,000 service members -- National Guard and active duty -- are standing by ready to assist as Hurricane Florence hits the Carolina coast, DoD officials said here today. Defense Secretary James N. Mattis and Deputy Defense Secretary Patrick M. Shanahan are monitoring the Category 2 hurricane and the department is “leaning forward” to help civilian agencies as the storm approaches. “The secretary is also receiving reports throughout the day on actions the military services are taking to protect the safety and well-being of the military community, and ensure the readiness of DoD installations in the region affected by Hurricane Florence,” Kenneth P. Rapuano, assistant secretary of defense for homeland defense and global security, said at a Pentagon news conference. Both Rapuano and U.S. Northern Command commander Air Force Gen. Terrence J. O'Shaughnessy called Hurricane Florence a “dangerous storm” and urged Americans to listen to the warnings from state and local officials. O’Shaughnessy also commands North American Aerospace Defense Command. Outer bands of the storm have already started hitting the coast and officials said there are already winds exceeding 100 mph in some areas. The storm surge has hit in North and South Carolina and the storm is expected to slow down and deposit huge amounts of rain. DoD is already working with the Federal Emergency Management Agency to pre-position helicopters, vehicles and supplies. The department is prepared to assist FEMA and our other federal partners in supporting the affected regions, Rapuano said. O’Shaughnessy said DoD assets have virtually surrounded the area where the storm is expected to make landfall. “We are proactively positioning forces now to respond from the north, from the south, from the east and from the west, across the full spectrum of DoD capabilities at every level -- by air, by sea and by land,” the general said. Fort A.P. Hill, Virginia; Joint Base Bragg, North Carolina; North Auxiliary Airfield, South Carolina; and Maxwell Air Force Base in Alabama are staging areas for FEMA. About 80 light/medium tactical vehicles are staged at Fort Stewart, Georgia, set to respond quickly once Florence passes through the area. These trucks are high-water-clearance vehicles which can carry supplies or first responders. These vehicles proved their worth in this type of situation last year during Hurricane Harvey in Houston. At Hunter Army Airfield, Georgia, there are 35 helicopters available for search-and-rescue operations. A similar unit is at Fort Bliss, Texas, ready to move forward. At Fort Bragg, there are 40 high-wheel vehicles for rescue and transportation, as well as seven helicopters staged for use in search and rescue and recovery missions, the general said. The USS Kearsarge amphibious assault ship and the USS Arlington amphibious transport dock ship are following behind Florence. These vessels have Navy and Marine personnel, 16 helicopters and six MV-22 Osprey tilt-rotor aircraft. At Moody Air Force Base, Georgia, the Air Force has six HH-60 helicopters, two HC-30 aircraft and four pararescue teams at the ready. At Tyndall Air Force Base in Florida, 1st Air Force will provide robust command-and-control, air operations support to the DoD effort. 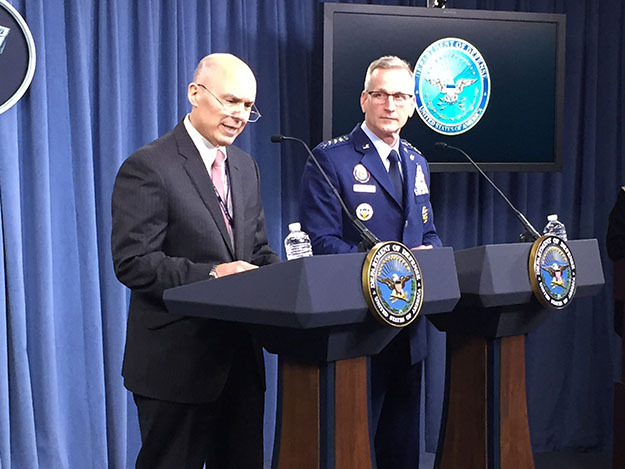 This will include airborne command-and-control assets. Mattis has activated dual-status commanders in North Carolina, South Carolina and Virginia to provide seamless command and control over assigned active duty and National Guard forces. Rapuano said U.S. Transportation Command is staging and prepositioning FEMA resources. “The Defense Logistics Agency is directly supporting FEMA logistics with the procurement and distribution of relief commodities, including food, fuel and water,” he said. The U.S. Army Corps of Engineers is also directly supporting FEMA and is poised to support flood mitigation, temporary emergency power, temporary roofing and debris removal, Rapuano said. The National Geospatial-Intelligence Agency will provide imagery analysis and assessment, he said.